At GIPHY, we create a lot of GIFs from live broadcasts –- TV shows, world events, sports games, and more. One of the tools we use to do this is GIPHY Capture – a MacOS app that lets you easily record your screen. Click to record, and click again to stop. Easy! But one unique challenge with live broadcasts is that it’s near impossible to predict when something is about to happen – and if you forget to click the record button you’ve missed the moment! We set out to build a feature to address this specific problem. Various products including video surveillance, dash cams, and broadcast servers have solved this problem using a process called loop recording. Video is recorded continuously to an endless tape (or computer memory). When the tape or storage runs out, the recording process continues at the beginning, looping back to overwrite previous content. This allows recording to go on indefinitely without the need for endless amounts of storage. When something eventful happens, the last chunk of recorded data can be retrieved. For our solution, we shipped a feature update to GIPHY Capture called “Infinite Capture”. When the app launches, users can drag and resize the capture window over the video they are trying to capture. When they click the record button, the app starts recording the screen. When the progress bar completes, it will begin overwriting old content – but the app will always have the last 30 seconds of video. The app can continue to record in this state indefinitely. When a significant event occurs in the live feed, the user can click the capture button to output the last 30 seconds of recorded video – guaranteeing they will never miss out on a GIF-able moment again! To implement the “Infinite Capture” feature, we needed to recreate this process using Swift and Apple’s AVFoundation framework. First, we implemented a way to store the frames in the same fashion as a “looped tape”. Fortunately, there is an analogous data structure to help us achieve this: it’s called a CircularBuffer or RingBuffer. A circular buffer is essentially an array that is connected end-to-end to form a circle (see image above). Reading from the buffer in the correct order. Let’s create a class for our CircularBuffer structure – backed by a primitive array. We also need to keep track of the current writeIndex. * Appends a new value to the buffer. Warning: For simplicity, the example above is not thread-safe. To support concurrency, you should use a serial dispatch queue or semaphore to control write access. The main trick is that the writeIndex needs to wrap back to the beginning when the buffer is full. We can use the mod operator to handle that. The new element will then overwrite any data that was previously there. * was written, as a sequential array. For reads, there are 2 cases. The buffer isn’t full yet. In this case we simply read from the beginning (self.buffer) up to the last written index (self.buffer[self.writeIndex - 1]). Buffer has been filled up and writes have “wrapped around”. In this case we need start reading at self.buffer[self.writeIndex] which will be pointing at the “least recently written” element in the buffer. That’s it! Now that we’ve built our CircularBuffer class, we can start using it to store our recording. AVCaptureVideoDataOutput outputs the captured frames as CMSampleBuffer objects. AVCaptureVideoDataOutputSampleBufferDelegatecaptureOutput:didOutputSampleBuffer:fromConnection: can then feed the frames to AVAssetWriter which will save out the video to a file. For our use-case, we want to store the frames in a CircularBuffer instead of writing directly to a video file. When the user wants to save the current buffer, we feed the frames stored in our CircularBuffer to AVAssetWriter to write the video file. Note: Because AVCaptureSession allocates and reuses the CMSampleBufferRef in a pool, you’d actually need to clone it before retaining it – otherwise you will run into memory management errors. For more info, see this StackOverflow thread. If we then take the frames stored in CircularBuffer and write it out to a video file, it would yield the expected results. However, you will notice that recording uses up a lot of memory resources – depending on your recording this could easy go into the gigabytes! The problem is that we are storing uncompressed frames. A 10 second, 1080p video, at 30 FPS would result in 1.8 GB of memory usage (10s x 60fps x 1920px x 1080px * 3bytes/px = 1.8GB)! To optimize, what we want to do is encode/compress the frames before storing them in our CircularBuffer. Unfortunately, AVFoundation is too high-level to support “on-the-fly” encoding like this, so we’ll need to drop down into Apple’s Video Toolbox framework. 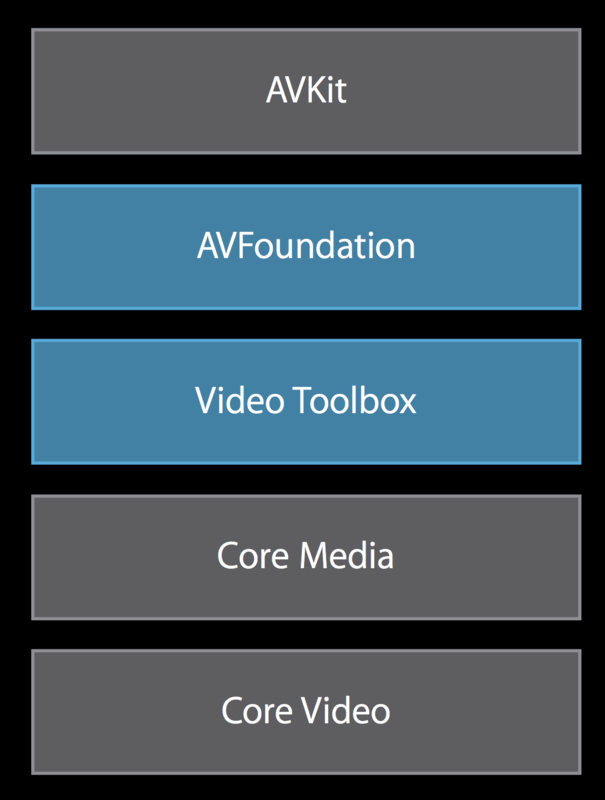 The Video Toolbox framework provides hardware-accelerated video encoding and decoding capabilities. Note: Video Toolbox contains classes and functions that are written in C++ so we will need to use the .mm extension and some of the syntax may look funny. Above, we initialize our VTCompressionSession with H264 as our desired codec. You can also use VTSessionSetProperty()to specify additional encoding settings (bitrate, framerate, pixel formats, etc.). We also provide a VTCompressionOutputCallback which will get fired automatically after each frame is successfully encoded. A CMSampleBufferRef contains 2 main components: the actual pixel data for the frame, and the timestamp of when the frame should be displayed. We extract these 2 properties and call VTCompressionSessionEncodeFrame() to encode the frame. Running the new implementation we notice significant improvements in performance. The actual % gains depend mostly on the video content and how “compressible” it is. But from our own testing, we saw memory savings in excess 10X. On current Macbooks, we were able to store a 30 second buffer containing 1080p, 60FPS video frames without issue! Try out the new feature for GIPHY Capture and let us know what you think!